Unless you’re Cinderella and spring-cleaning is done with the help of some music and mice friends, it’s a pain to dig through your hard drive to dump duplicate files. 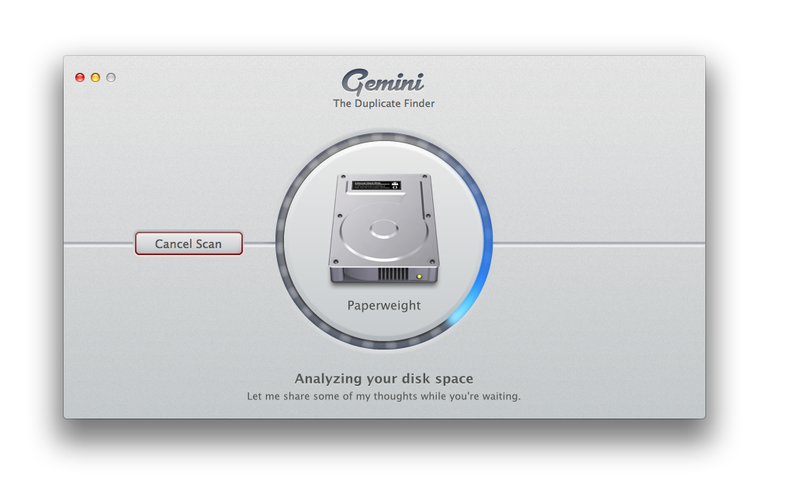 Gemini (Mac App Store link) attempts to make this process a little bit easier—and, dare I say, a little bit more fun. Gemini will comb through anything you tell it to, spitting out snarky phrases to keep you from getting too bored during the wait. Once those files have been scanned, the app morphs into an iTunes-esque interface, showing you just where your dupes are hiding. Gemini’s sniffer engine is pretty good, matching the content of the duplicate rather than the file name alone—if you’ve named the same picture with two different titles, for instance, the app will still tie them together as duplicates. Gemini also divides your files up into categories, so that you can view duplicate documents or photos before deleting the excess. Click on a file, and you’ll see a Quick Look preview along with how many versions of the file there are, where they’re located, and if they can be safely removed. (Gemini doesn’t let you remove files linked to your iTunes library to prevent you from accidentally deleting something iTunes may corrupt itself over.) You can check a box to send that file to the removal bin, or leave both files as is. 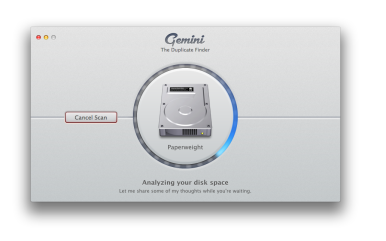 If you want to dump every duplicate file and folder Gemini has found, you can click Auto Select, though I don’t know if I’d recommend that, as certain programs (like Microsoft Office and Adobe’s CS suite) keep the same exact preferences over multiple versions of its software, leading to folders that appear to be duplicates but that you probably shouldn’t trash. You can also Auto Select categories, rather than all your files, which may be more practical. Once you’ve made your selections, hit the Remove Selected button to trash your duplicate files. Gemini will give you a final one-sheet of all files you’ve marked for deletion; you can individually remove any mistakes, or trash the lot by clicking on the Remove button. The app will virtually “shred” the one-sheet, then pop up a success dialog that tells you just how much space you’ve saved (and offers you a way to tweet this information to the masses). It may not be as full-featured as some cleaning programs, but Gemini does its job well, and with just the right amount of cheek, at that.